Construction Expert? 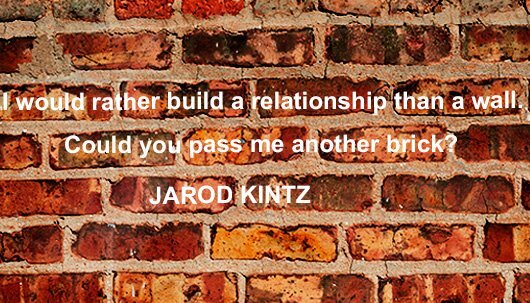 Are you building Walls or Relationships? I have been in the Construction Management industry for a 10 years, and I’ve seen a true disconnect between the technology available and the utilization of it. Don’t get me wrong. There is a lot of technology available for use. But the problem is not with technology, is it? Doesn’t the challenge presents itself with the people that use it? There has been a lot popularity around project management as well as collaboration software. Are people using it to these softwares to it’s fullest potential? Are we building relationships? It is certainly not that people are incompetent – the industry on a whole is very competent, if I may say so.. The problem is their mindset. “What do you mean, Brittanie?”, you ask. Well, I’ll tell you in a bit after this short story. There is fencing contractor that starts building a fence by building an 8 foot length of a fence and sets some bait in the middle of one side of the fence. A sly fox waits a while for the smell of people to go away so he understands it is safe. He then comes and enjoys the bait he has been smelling for hours. The next leg is built to create a U and the bait is placed right in the middle. The same thing takes place: The Fox waits. Sees no one. And snatches the bait thinking he is the only fox that doesn’t have to hunt for food! Lastly, the fencer builds the fourth 8 ft length of the fence. Just as planned, the fox has not left the inside of the now 4 four sided enclosure! The fox is happily inside, not realizing he is trapped and that he is also without food, and also that he might soon be shot with tranquilizer gun. He is no longer safe or getting subsistence. He has not realized that although he only was prancing around in the same space for the past several days, that his scenario has completely and drastically changed. Who are you in this story? The trapper? Or are you the Wiley Fox? Not broken, so why bother? Have you been doing the same thing over the years and have not realized your scenario has completely changed? Has your scenario changed because of technology? How about the way you build business relationships? What if NOT using technology to build relationships is just like having a fence built around you? Are you safe? Execute the job by meeting the schedule and the budget. Executing the job, is the interesting part. There are so many factors in the process, from scheduling, change orders, construction accounting, operations, the technical design, the aesthetic design.. and the list goes on and on – as you know as an industry expert. All of these items are discussed with the owner, with the designer, and the contractors, not to mention the owner’s rep, and each project is supposed to go as planned. All of these activities and parties involved, but where is the relationship building in all of this? What do the things we’ve learned – Please the client & execute at a high level – have to do with mindset on relationship building? Relationship building is usually not the focus. THAT’S THE PROBLEM! Are you building a fence or a wall? Or are you building Relationships? Want to stop hating the Construction industry and fix it? What’s your mindset? Tell me what you hate about the industry, or just about a situation that is challenging for you right now in the following survey. Tell me how you’ve been trapped inside by the inevitable industry built fence. Get it off your chest! Relax and feel refreshed afterwards. You aren’t the only one dealing with this. If there are enough people that deal with similar challenges, I will search for the expert on how to fix it and interview them for everyone to get the solutions on my podcast Constructrr. Click here to help me understand how you handle and manage challenges on your construction projects? Also, join my email list to get more posts like this and updates on my upcomingpodcast.